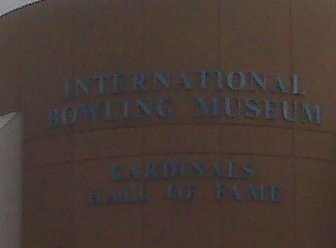 I have been in St. Louis, MO for the past week on business (training). I really underestimated the freaky weather they get here. On Sunday it was snowing, on Monday it was sunny but cold, Tuesday brought warm weather, Wednesday was raining and very cold, and Thursday was just plain foggy. While you are here, you can see the largest man made monument in North America. 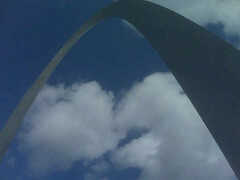 The St. Louis Arch! Gateway to the west. The Arch is actually pretty cool. In the 1960′s they built an elevator into the Arch which will take you to the top. The only thing is that people in the 1960′s must have been a lot smaller than people in 2008. The “pods” had seats for five people, but in actuality, they really fit about two average Americans. The view from the top was really amazing. On the one site you have a great view of St. Louis and Clayton, MO. On the other, you have a rather boring view of East St. Louis, IL. It’s funny how a river can really socially depress part of a metropolitan area. On Tuesday night we decided to check out the local casino (Lumiere Place). Apparently in Missouri there is a law on the books which states “an individual may not have a net loss of more than $500 in any odd numbered hour.” This boils down to the casino giving you a card which tracks your winnings and losses at each table and slot machine. If you approach $500 in any given odd numbered hour, you are flagged and must wait until two hours for the card to reset. Talk about a State making it hard for it’s people to gamble their lives away! This entry was posted in insanity, life, work and tagged insanity, life, work. Bookmark the permalink.